In the early afternoon of January 24, 1848, James Marshall was checking the progress of the sawmill he was building near Sutter's Fort on the banks of the American River. There had been huge rainstorms the previous week that had washed away rocks, topsoil and sediment. Marshall noticed gold colored flakes everywhere between the pebbles and the next morning discovered a small yellow nugget on the bottom of the river. Skeptical, he rode on horseback back to Sutter's Fort where he and John Sutter performed an assay on the metal he had found, confirming that it was indeed gold. It wasn't long before the word of the discovery spread, precipitating the largest and quickest increase in the gold supply the United States had ever seen. By the end of 1848, gold was available in such large quantities it began to depreciate, especially in the mining areas where provisions were scarce. Eggs sold for $3 each, flour for $8 a barrel, and butter was $16 per pound. A little lunch for two with two bottles of ale could cost more than $40. 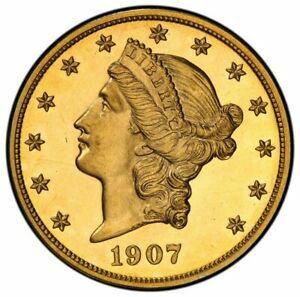 In the eastern United States, gold inflation was making silver coins more valuable. By 1849, the silver dollar was worth $1.03 in gold. Silver coins began to be melted for profit. In Washington, Congress was debating a controversial bill that included two new gold coins that would eventually be minted from California gold. By February 1849, Mr. James I. McKay, the lame duck Representative from North Carolina, and Charles G. Atherton, Democrat from New Hampshire, had pooled their resources to develop joint legislation for a $1 and a $20 gold coin. It was argued that a high denomination coin might be more convenient to a depositor with a large amount of bullion. During the House debate, McKay observed that the Act of 1837 required the mint to deliver whatever current coins the depositor wished. As an inducement to pass the bill, the coinage authorization would be for two years only. The legislation wouldn't be renewed if the coins proved unpopular. Many legislators were critical of the bill, but Senator Thomas Benton of Missouri predicted that the double eagle would be in greater demand than the gold dollar. He was right. The double eagle denomination lasted eighty-five years to the gold dollar's forty. From 1850, when the first regular issue double eagle was struck, to 1933, when the denomination was suspended by the emergency decree of President Franklin D. Roosevelt, more than 174 million pieces were minted. The Liberty double eagle design is credited to James B. Longacre but has its roots in Christian Gobrecht's $10 Eagle of 1839. The obverse features a Greco-Roman head of Liberty facing left, with hair tied in a bun and curls flowing down to the base of the bust. She is wearing a coronet inscribed with LIBERTY. Thirteen stars surround the bust with the date positioned below. The reverse depicts an eagle with outstretched wings holding an olive branch and arrows. A shield with straight sides (Type 1) gave way to a rounded ornate shield in 1866 when the motto IN GOD WE TRUST was added to the oval of stars above the eagle (Type 2). There is a pattern of rays in a semicircle touching each wing. In 1877, Chief Engraver William Barber replaced the denomination TWENTY D. with TWENTY DollarS (Type 3). When grading this design, look for traces of wear on the hair above Liberty's forehead and behind her ear, on her cheek, and on the coronet. On the reverse, check for wear on the eagle's neck and wing tips, and on the top of the shield. It's usual to find an abundance of bag marks on these big, heavy coins. 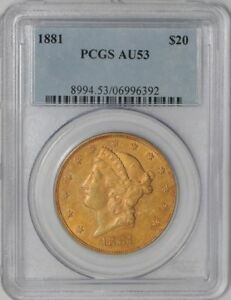 The Type 3 Liberty double eagle was by far the largest mintage of the three types with 64,137,477 business strikes and 2,426 proofs minted from 1877 through 1907. Five facilities minted the coin during its thirty-one-year run: Philadelphia (no mintmark) and San Francisco (S) were the major producers, with Carson City (CC) augmenting mintage until 1893, New Orleans (O) striking coins only in 1879, and Denver (D) coming aboard for the last two years of 1906 and 1907. Mintmarks can be found on the reverse below the eagle. The 1904 Philadelphia mintage alone dwarfed all others with over 6.25 million coins produced. Collectors looking for a gem example of this design for a type set will invariably find this date. Unfortunately, counterfeits of this and other dates abound. Many Lebanese counterfeits were originally sold in the Middle East and Europe as gold bullion in a recognizable form (double eagles contain almost an ounce of pure gold). Most of these bogus coins are easily identified by an expert, but are made well enough to deceive a novice collector. Millions of Type 3 Liberty double eagles were shipped overseas in the late 19th and early 20th centuries to be used as bank reserves. 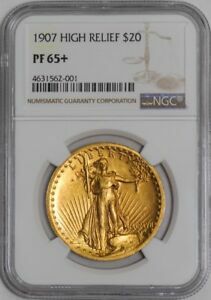 When gold coin production ceased in 1933 and Americans were required to turn in their gold at face value for melting, the flow of double eagles out of the country was enormous. Fortunately, foreign hoards turned out to be the source of many rarities that would otherwise have been destroyed. In recent years, average circulated, common date Liberty double eagles have been used as a hedge against inflation and as an alternative bullion coin to the Krugerrand, Maple Leaf and American Eagle. 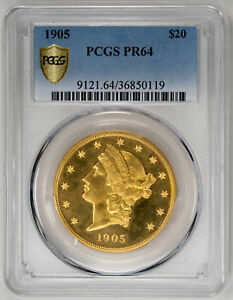 Students of Type 3's will discover that though the mintage was vast, high quality uncirculated specimens are rare and the series contains several major rarities. These include the 1879-CC, 1879-O, the Philadelphia issues of 1881-87, and the Philadelphia issue of 1892. Alterations exist of the 1881, 1882 and 1885 issues with the "S" (San Francisco) mintmark removed. There is a certain tactile pleasure in handling these large gold coins. It's hard to imagine when we look at today's tokenized, clad coinage that these beautiful gold pieces were once used as money. Until the early twentieth century, gold was a universal currency that gave the holder economic freedom anywhere in the world. This freedom was revoked when gold was demonetized in 1933, but it has been restored today in the form of the credit card. Of course, to numismatic purists, the plastic card can hardly match the aesthetic experience of seeing or touching these magnificent double eagles. In 1907, Theodore Roosevelt commissioned noted sculptor-artist Augustus St. Gaudens to redesign the eagle and double eagle. 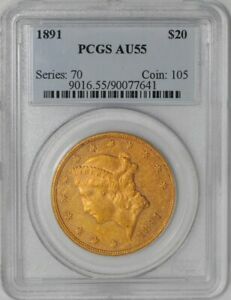 The resulting $20 gold coin struck in high relief was fantastically beautiful, but impractical as coinage. After St. Gaudens' death in August of 1907, Mint Engraver Charles Barber redesigned the coin in low relief. It was issued until 1933, when all gold coinage ceased. Akers, David W., United States Gold Coins, Volume VI, Double Eagles 1849-1933, Paramount Publications, Englewood, OH, 1982. ANA, Selections From The Numismatist Double Eagle and Gold Dollar in the 1849 Congress by E. G. Bradfield (1949), Whitman, Racine, WI, 1960. Bowers, Q. David, Adventures with Rare Coins, Bowers & Ruddy Galleries, Los Angeles, 1979. Breen, Walter, Walter Breen's Complete Encyclopedia of U.S. and Colonial Coins, F.C.I. Doubleday, New York, 1988. Metcalf, William E. America's Gold Coinage Reflections on the Gold Coinage of the Twentieth Century by Elizabeth Jones, ANS, New York, 1989. Winter, Douglas, & Cutler, Lawrence, M.D., Gold Coins of the Old West: The Carson City Mint 1870-1893, Bowers &Merena Galleries, Wolfeboro, NH, 1994. Winter, Douglas, New Orleans Mint Gold Coins 1839-1909, Bowers &Merena Galleries, Wolfeboro, NH, 1992.